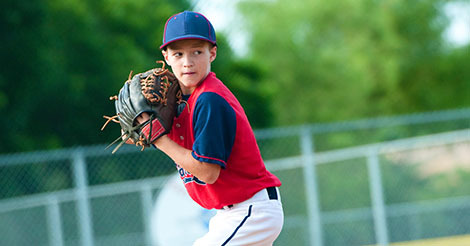 Little Leaguer’s shoulder is an unfortunately common cause of shoulder pain in young throwing athletes. It is a problem that results solely from overuse, and specifically, from too much throwing. It almost always develops over time, although the athlete might remember a specific throw that initiated the pain. In the office, a sports medicine physician can diagnose this problem fairly easily. While the examination is not remarkable for any specific physical examination test being positive, the young athlete will often be tender at the top of the humerus and have pain with full external rotation and internal rotation. X-rays almost always help with the diagnosis. The physician will note widening of the growth plate at the proximal humerus. Often this can be subtle, so comparison x-rays of the uninvolved shoulder are often needed. 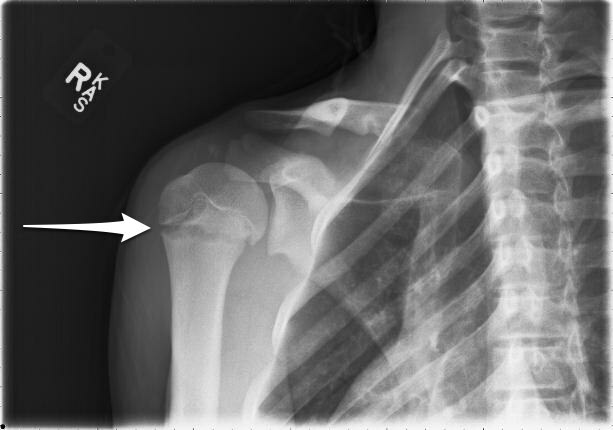 Note the widened growth plate (white arrow) in the x-ray of a young pitcher’s shoulder. Treatment is fairly simple in that the athlete will have resolution of his symptoms with cessation of throwing. The thrower might only have to take 2-4 weeks off, but often it can take 2-3 months. The physician will usually obtain repeat x-rays periodically to ensure that the widening of the growth plate is resolving. As the young athlete’s pain decreases, the sports medicine physician might allow the child to start a long toss program. Attention to proper mechanics and stretching and strengthening exercises can also be beneficial. This is essentially an overuse problem, and prevention is the key. Throwing too many pitches in a game or throwing session, pitching too many innings in a year, pitching for multiple teams during a season, and not getting at least three months off from throwing in a year are the most common culprits.